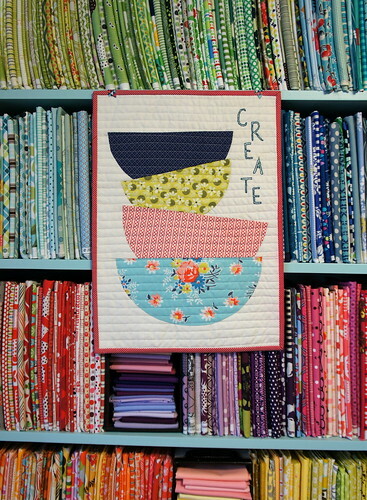 One of the things I’m participating in right now is a swap called the Sewing Room Swap over on Flickr. I think I’ve mentioned it before here. I can’t reveal my partner just yet because it’s all private hush hush until they get their complete package. But I thought I would show you one of the items that I have made for her. 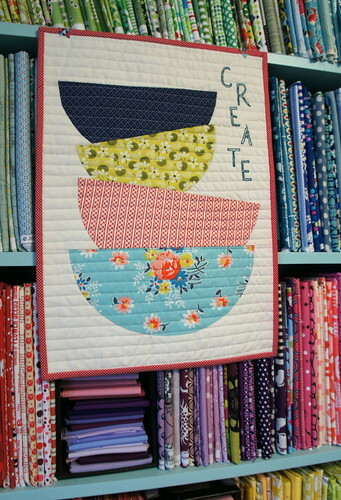 This is a wall hanging for my partner’s sewing room. It is made from half circles that I pieced much like you would sew a 1/4 circle for a drunkard’s path block for example. It’s just more of the circle! I gave myself plenty of background fabric (Laura Gunn’s painter’s canvas) so that I could improv piece these together. It takes a little bravery to slice into perfectly sewn half circle pieces, but I knew that I wanted a stack of bowls that teetered this way and that. So slice I did! And sewed them all back together to achieve this stack of bowls. I went one bowl at a time so that I could play with the layout and angle of each bowl. 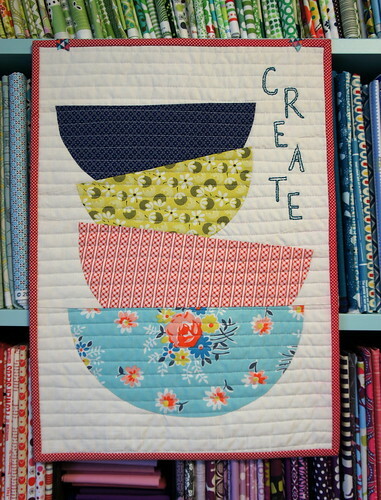 I needed to quilt this but didn’t want to detract from the overall picture of the bowls. So this straight line repetitive quilting actually blends into the image and creates texture without distraction. 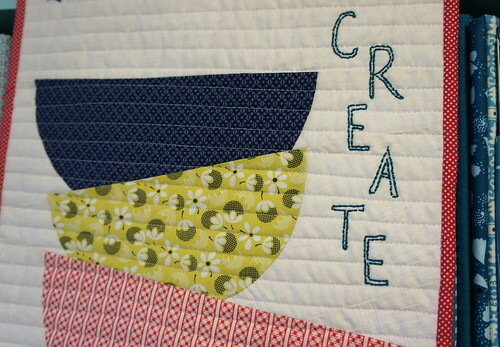 And I did some free hand back stitch embroidery to add the word CREATE. I did the embroidery after I bound and finished this so that I could place the letters in the right place, but that was definitely the harder way to go. Live and learn! And I had to have a picture of it finished with gratuitous amounts of fabric behind it! Oh and the fabric IN the mini for those bowls is all DS fabric from her Joanns lines. Aren’t they perfect for retro looking bowls? All in all, I’m pretty confident that my partner will like this. This is my small project for her, so now I’m off to work on the big project. It’s so fun to make pretty things for people you know will really love and appreciate them, right?! I wish I could see the inner workings of your brain because you come up with the most clever of ideas! wow you pieced the bowls? i thought they were needle turn applique. very impressive! This is just darling, and now I want to try something like this! I love it! So cute Angela!!! Just adorable!! I love this, and I love nearly every DSQ print, and especially these. Maybe this is for me, yes? I will cross my fingers! Very cool! Might we be able to learn how to do this, like, say, next spring? Thank you! I do hope she will like it. Now I need to get working on that second item. Lovely! it is an awesome effect and a nice gift! Lucky recipient indeed! Adorable! What a fun project that must have been. It really was! I was a bit nervous but I just plowed ahead! This is so gorgeous! If I'm your partner you can be sure I totally love it. Your stash is looking pretty amazing in these pics too! Totally cute mini, but I am stuck mesmerized by your fabrics. I love organized fabrics. Your shelves are just about heaven. Amazing. I think this might be the thing to push me to try piecing a circle. Love this!! Perfect choice with the fabrics.